TEMPLE ENTRANCE: You enter the MOUNTAIN TEMPLE at the north end of Paititi. 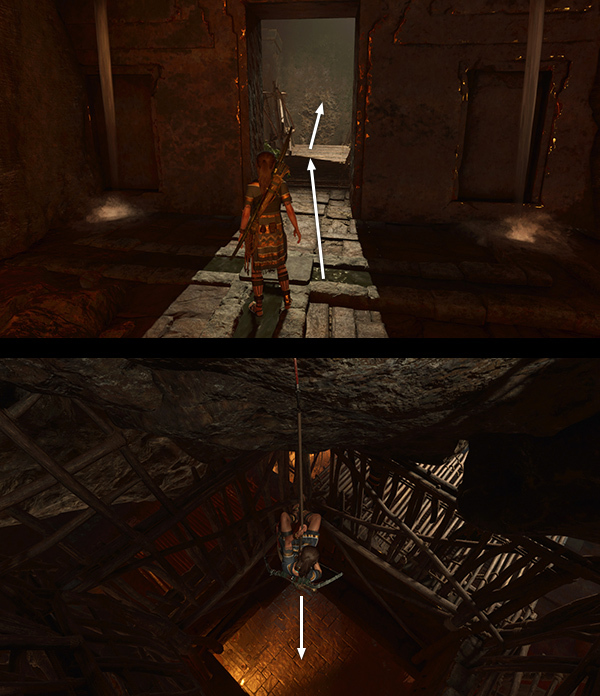 (screenshot) Move deeper inside, jump over to the climbable wall, and rappel down past a couple of cult guards whose backs are turned. (screenshots) Drop into the anteroom below and gather a few resources. 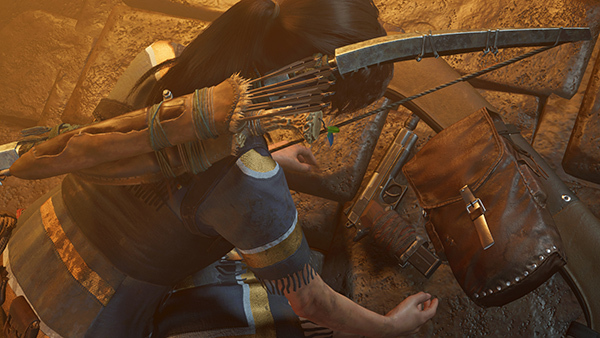 As you move through this room, a brief cutscene shows Lara taking a pistol out of her rucksack. (screenshot) This is meant to alert you that you now have use of all of your weapons again. Lara contacts Jonah over the radio to tell him she's entered the temple. He says that Unuratu will be ready when Lara opens the gate from inside. COMBAT IN THE TEMPLE COURTYARD: There are 8 enemies in the large, open area between here and the gate. You'll need to clear them out in order to reach the gate mechanism. If you like fast-paced combat, you can enter with guns blazing. There are plenty of walls and ledges so you can maneuver around the area and take cover. You'll also find healing herbs and other supplies, as well as several large red jars of gunpowder that you can shoot to take out nearby enemies or create a distraction. Go for it! If you'd prefer a stealthier approach, I have described a sequence that worked fairly consistently for me in this section with screenshots. It includes tips on using the Scavenger Skill Serpent's Fury for a Chained Takedown, a maneuver you'll need to master for the Chain Gang trophy/achievement, and also the Warrior Skill Howler's Troop, which lets you fire arrows at two enemies simultaneously. If you haven't unlocked these skills yet, there are alternative tactics as well, including crafting smoke bombs using empty ceramic jars. 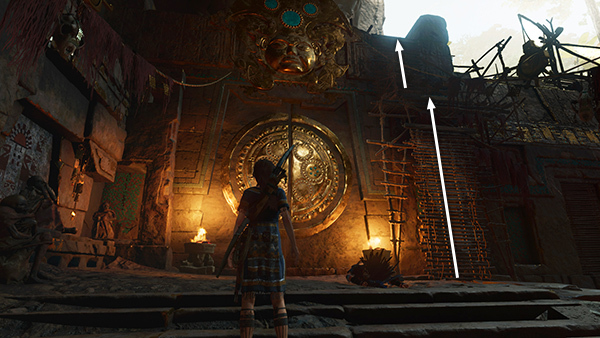 Lara turns the huge wheel to open the gate so Unuratu and her companions can enter. 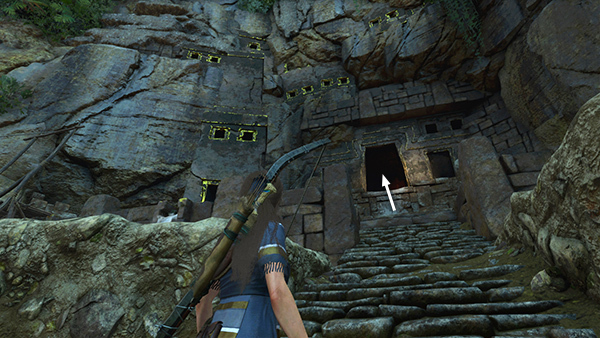 Lara then makes her way to the inner gate and uses the serpent key to open it. Unuratu and Uchu emerge from a side area with Etzli just as the cultists realize their stronghold has been breached. As the cult members move in on the rebels, Unuratu orders Uchu to take Etzli to safety. She allows herself to be surrounded and captured in order to draw attention away from her son and from Lara, who sneaks through the inner gate. THE EYE OF THE SERPENT: As you move out the rear of the temple, Lara and Jonah touch base over the walkies. Then you get a good look at the Eye of the Serpent, a manmade island in the middle of the rapids. Naturally there's no convenient bridge, so you'll need to climb. †UPDATE HISTORY: 10/15/18 - First draft of walkthrough posted online.